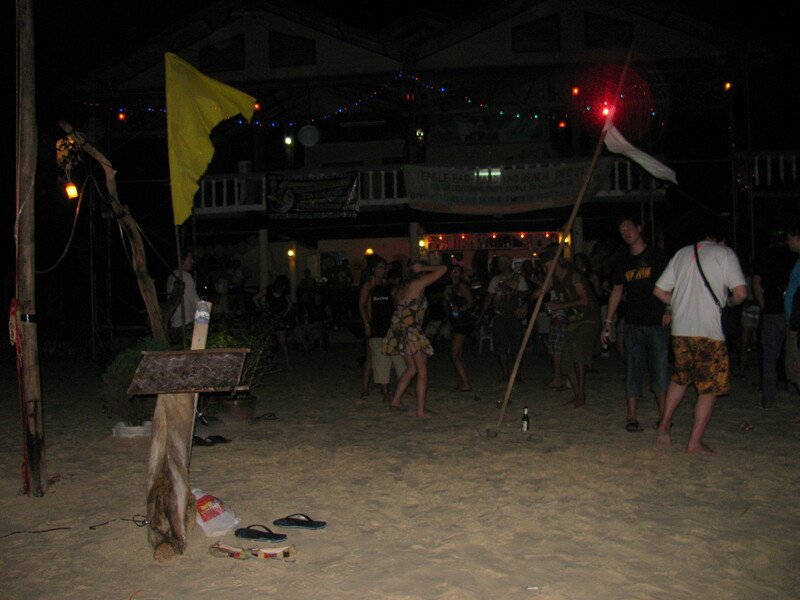 The Full Moon Party is believed to have started in 1985 on Haad Rin beach in Koh Pha Ngan. 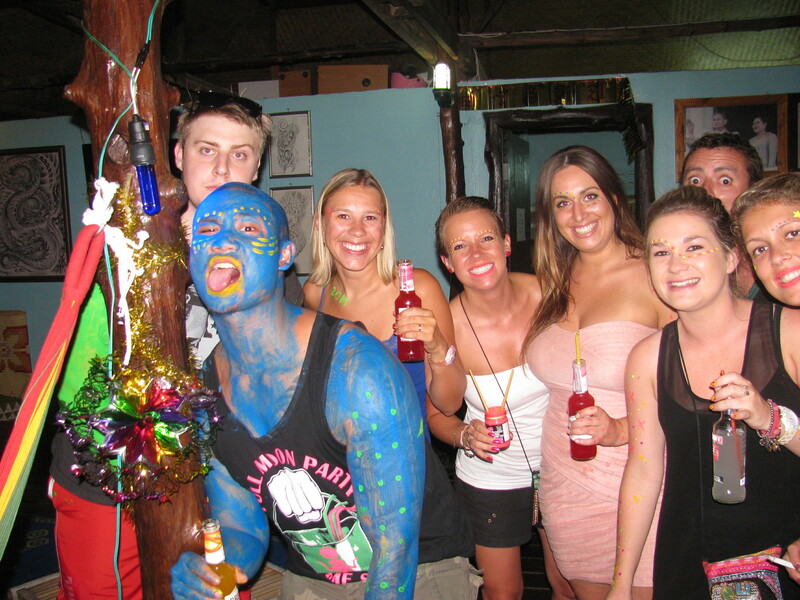 It was a legendary party that was spread to other backpackers traveling the region until it steadily grew bigger and bigger. 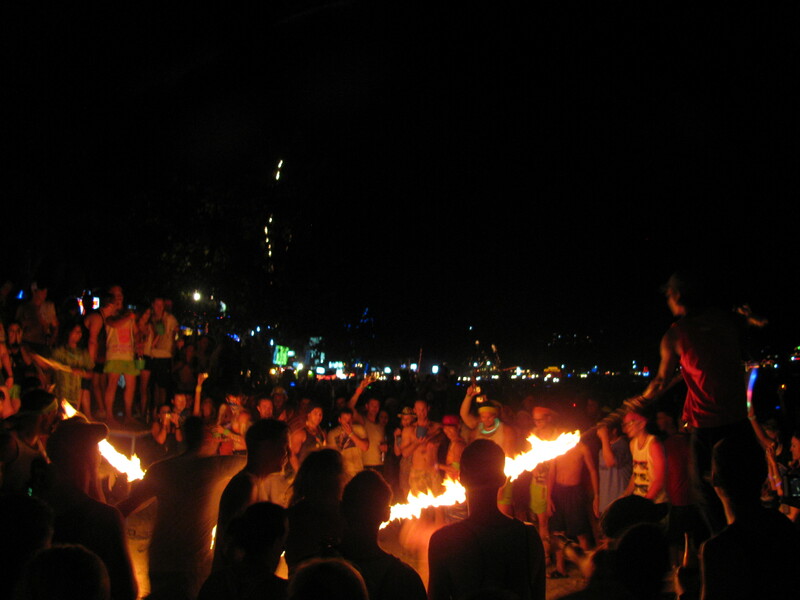 These days some of the parties have as many as 60,000 people at them and you can also attend half-moon parties in the Jungle. 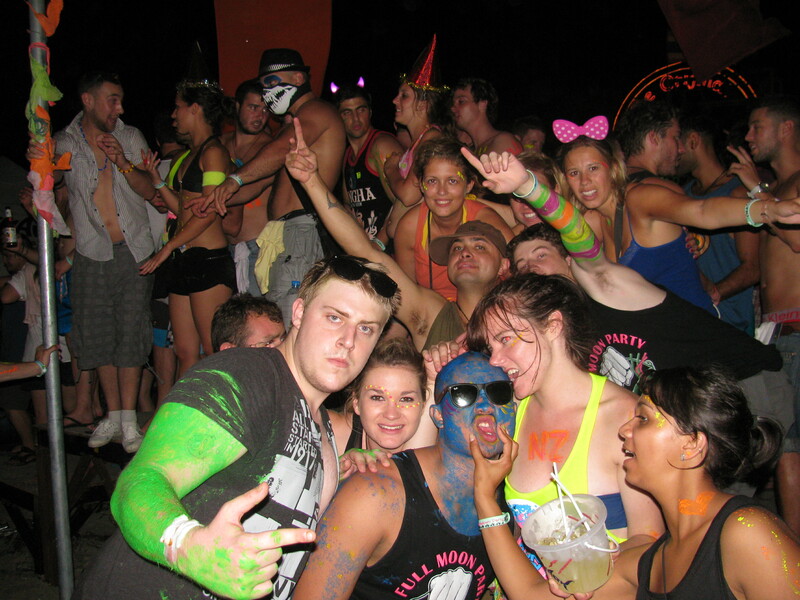 (Then they have black moon parties, and jungle parties and I have no idea what exactly they entail). 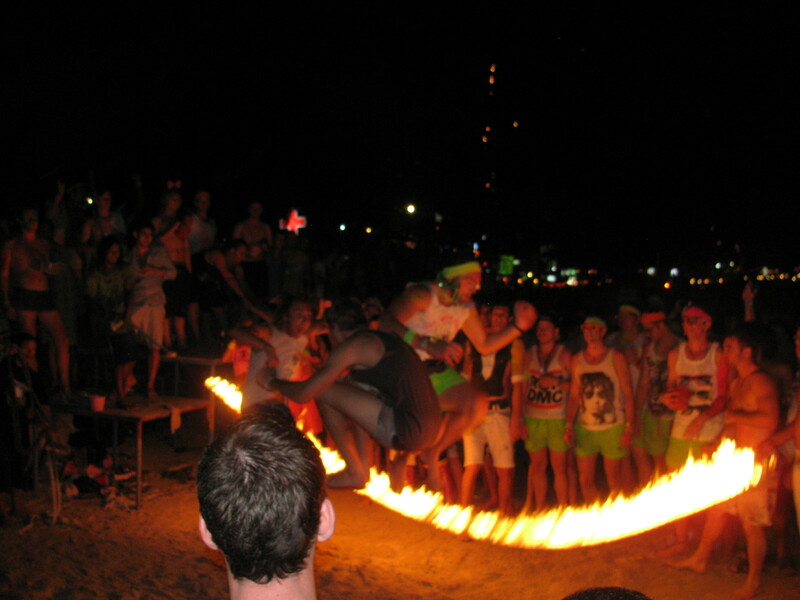 Other islands around the world have their own full moon parties these days, but none of them are anywhere near the scale as the ones in Koh Pha Ngan. The greatest party of the year is supposed to be the New Years Eve party. There’s not actually a Full Moon but no one seems to mind this detail. Tim and I came as spectators. To be honest, we thought we were no match for the antics that were supposed to take place and were pretty apprehensive about what the night had in store but it turned out to be a blast. Tim and I had dinner on the beach. We were served complimentary Sam song(local Thai whiskey that sneaks up on you quickly) with fruit at the end of the meal. Pregaming and Painting with the Shiralea crew. We had already spent some time with a lot of the other guests at our resort. The owners had offered to order Songthaews (trucks turned into taxi) for everyone at the same time to go together. I didn’t realize it was tradition to paint yourself in blacklight paint. Our rides appear. 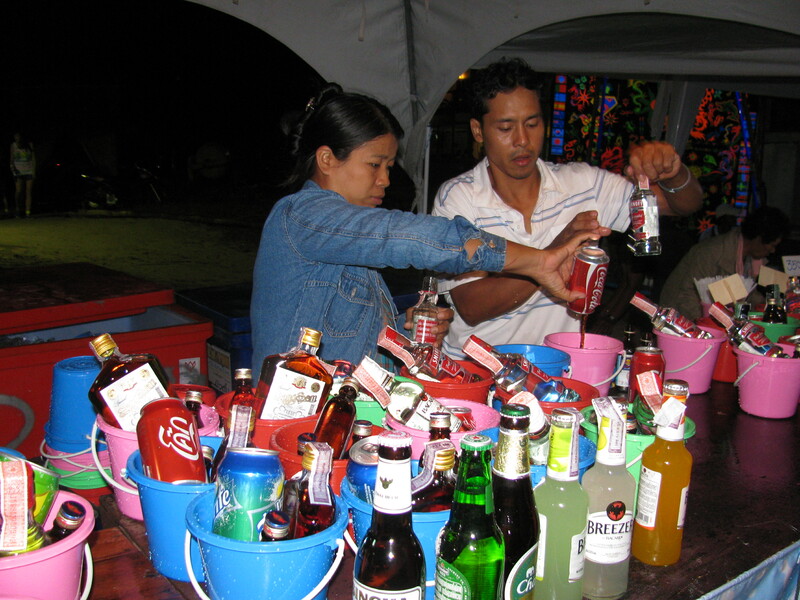 We all grab two last drinks for the road before a 45 minute ride to the party on the other side of the Island. The ride there was half the fun though. Sure, we had to stop at drug checkpoints about three times, but most of the ride was spent laughing and singing. After being dropped off and walking a good ways down to The Paradise (the original full moon spot) all 30 of us have our buckets in hand and the music is good so we dance in the sand. Tim and I explore as much of the beach as we can. It bottlenecks up towards the middle where you can see a lot of people who have indulged in too many buckets already. If you look in the wrong places you see all types of things you don’t want to see. I won’t go into details. We decide our spot at The Paradise is in indeed the best spot on the beach and head back. Happy New Year! All the usual celebrations. fireworks, loud bangs, antics of every kind. The countdown was the most unorganized we had ever seen though. Everyone seemed to be surprised it was midnight. Losing track of time seems to be a crucial ingredient to the party though, I can’t think how else some of the people continue to party until the next afternoon. In the late hours the party seems to hit it’s peak with only a few people passed out on the beach (or carried off on stretchers), and everyone seems to be caught up in the atmosphere of the party. We finally manage to secure a Songthaews and cram 22 people inside. 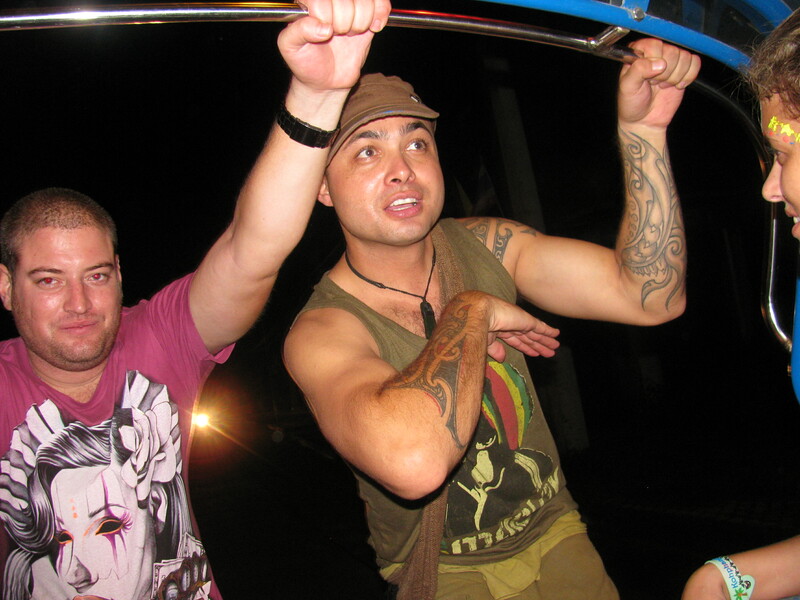 Including Bayden and Richie hanging on to the back for dear life (now that’s customer service). Singing ensues. Everything from Christmas carols to a rendition of Fresh Prince of Belair (yes, even people from New Zealand know all the words). We walk the length of the beach back to our resort. It happens to be high tide which means we had no choice to wade up to our waste in the ocean in order to get home. It’s another day in paradise nursing a hangover. 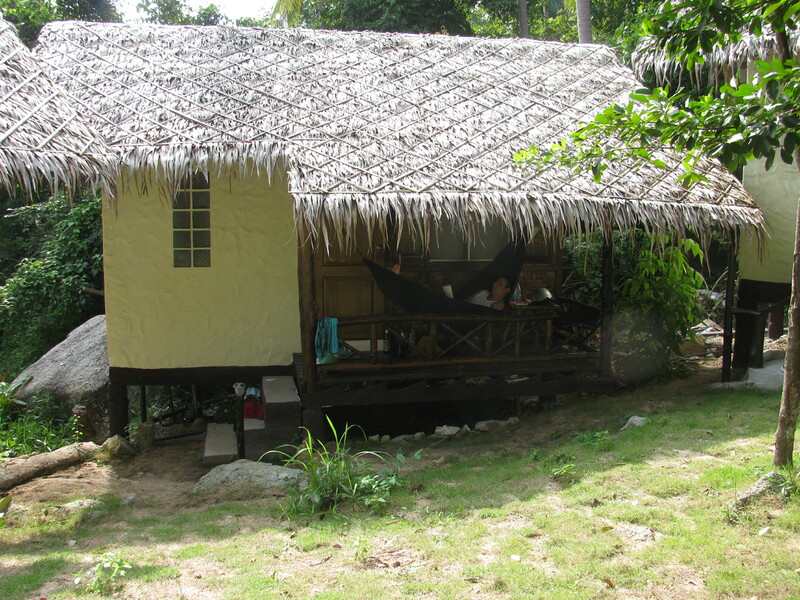 Tim hangs out in the hammock at our bungalow while I take in the beach. It was nice meeting you guys in Phuket. I found your blog and look forward to reading the rest of your updates. How was Vietnam for CNY? We are back home and adjusting to winter. 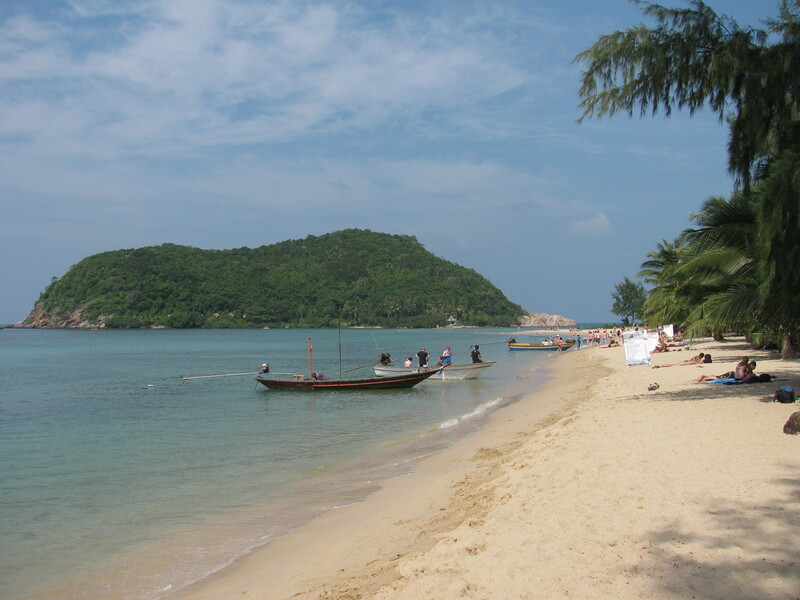 brrr, we just finally found our way back to a beach(Hanoi was quite cold though if it makes you feel any better). Tet was great but it is also a bit of a nightmare to try to travel around Vietnam during the 7 days of celebration since so much is closed and trains and planes get all booked – all worth it though. I don\’t even know what to say, this made things so much easeir!